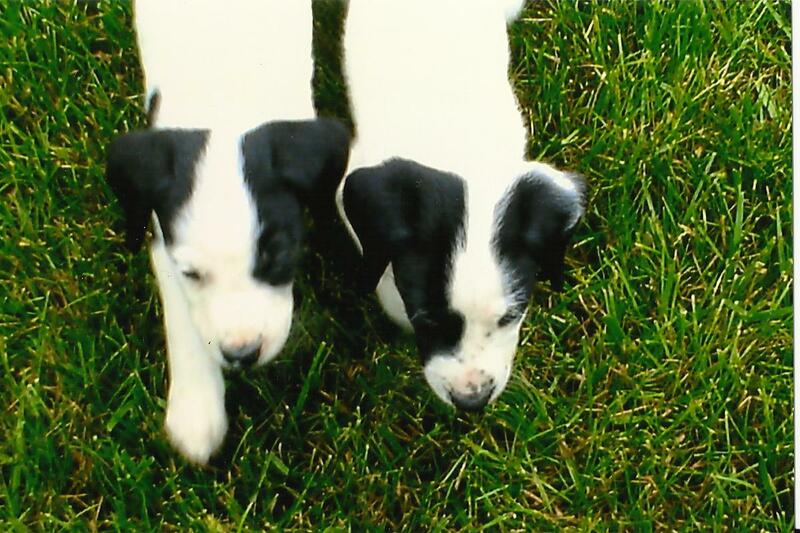 twice is nice: Happy Birthday Daisy & Duke! Happy Birthday Daisy & Duke! Happy 4th Birthday Daisy & Duke! When Patrick and I got married in January 2007 (after being together since May/June 2003), we soon bought our first home together in April. As soon as we moved in we knew that we wanted to adopt a dog. Little did we know, that we would get two. We did a ton of research online and in the newspaper, and we both decided that adoption was the only way to go. Buying an animal from a pet store just supports puppy mills - period. And neither one of us believe in that...so after researching for about a month, scoping out all the different adoption agencies in the KC area. We found a company called TARA. 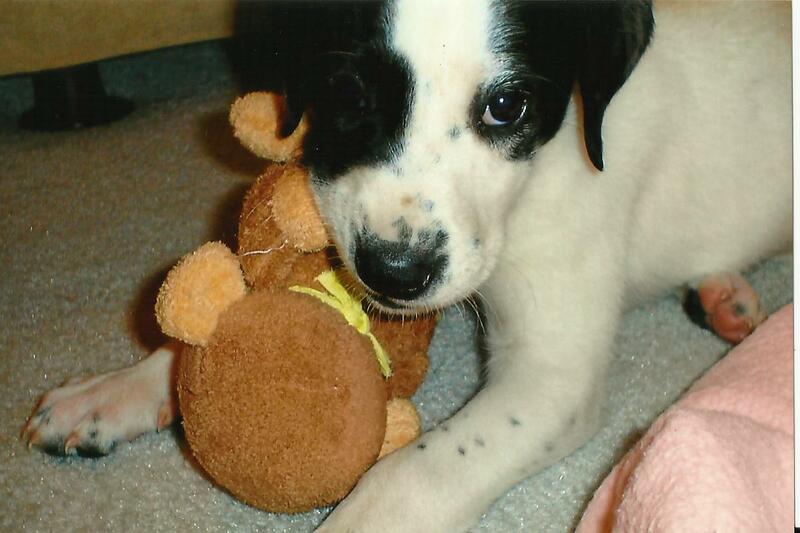 This company not only has a great story, but strives in helping animals find loving homes. 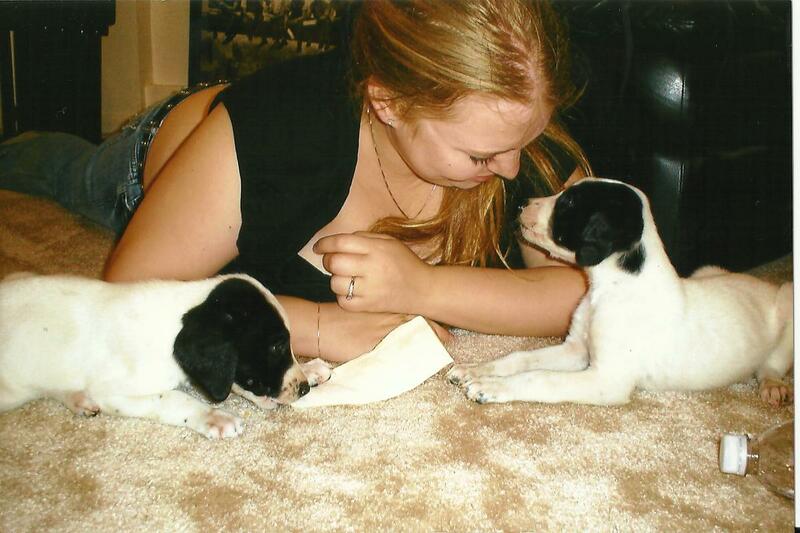 We found a story, and pictures of a litter of 14 puppies just born to a great dane/lab mix. After a handful of phone calls and emails, we set up a time/date to go pick out the puppy that we wanted. The two of us drove out to Peculiar to a nice home with a full house of children, and animals alike. When we arrived, we were greeted by a very nice woman who took us out back to meet all the puppies (who were 4 weeks old), their mother, and some of the mother's relatives (I think it was her uncle and a sister). 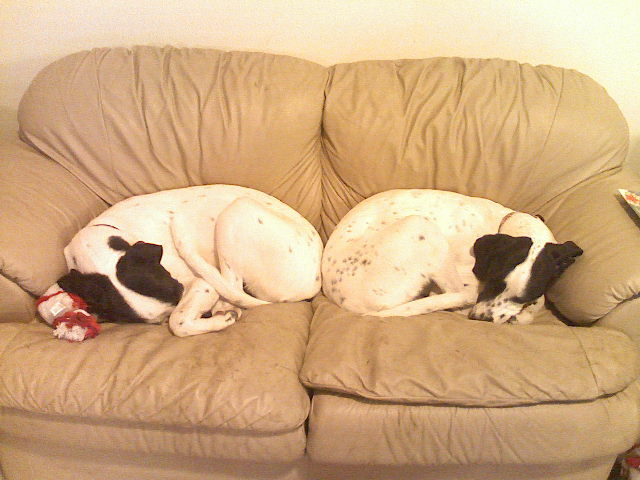 Their mother was a great dane/dalmation/lab mix and their father was a black lab (a neighbor's dog). Out of all the 14 puppies, almost all of them were yellow/white; we saw three that had black and white markings (which is what we wanted) and we couldn't pick out just one...so we picked a boy and a girl. I took a few pics of the puppies on my old cell phone (I hope to be able to get them off there someday)...I always wonder what happened to their brothers and sisters. Would they know each other? Are they just as big? Its kind of sad to think that all the millions of animal (dog/cat) families that are not able to keep in touch. Would they remember their mother? After a couple weeks passed (and after many debates on what we should name them), the puppies were taken to Country Kennels (a vet and hotel for animals in Raytown). The dogs were taken there to be checked out, given their vaccines, etc. We then had to tell them what their names were, and were given their license, registration and all the information we would need. In May 2007, our family of 2 became a family of 4. We now were proud owners of two adorable twin puppies. They were our babies, and still are. We immediately became 'mommy & daddy" long before our biological daughters were born. If you love dogs as much as I do, you will understand. We learned about kenneling, potty training, puppy food ~ and we were in for the long haul! We introduced them to almost every family member and took so many pictures (I wish we would have taken more looking back). 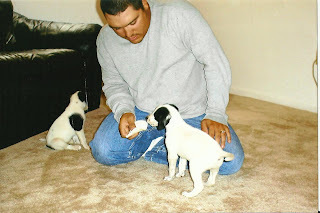 Small facts about them...when they were puppies ~ they were all white with no spots at all (except for their black ears & Duke had one large black spot on his right side and tail). As they got older, they got more spots. 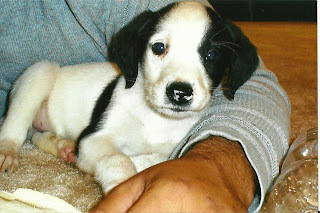 Duke also had white on his nose, which went away as great bigger. About a week or two after bringing them home, Daisy became very sick. She kept throwing up, and could barely stay awake/stand up. We rushed her to the emergency vet in Lee's Summit, and they wanted to keep her overnight. They said she might not make it through the night if we hadn't. After talking with Pat, we said it was 'Parvo' I don't quite remember what it was that she had - but it was a reaction to the vaccines. Whatever the vaccine was preventing, it gave it to her anyways. After spending the night at the ER, we took her to Country Kennels where they took care of her for a couple more days until she was herself again. I don't remember being so scared and upset in my entire life. Ever since Daisy was sick, she has always been much smaller than her brother. But to this day, she is still very healthy and is leading a very happy life! Now as a family of six, we are so incredibly blessed. They truly make us feel so loved when we come home for a trip to the store, or just after playing outside. Their entire backside (tail included) wags with them, and you can tell how much they love us. As much as the disgusting slobber kisses filled with drool can cover us from head to toe, we still love them just as much as our girls. They are apart of our family, and although we cannot always take them with us on trips, or out to eat (their favorite!) we still show our love for them in many ways. Current size...Bubba is almost over 100 lbs and Daisy is at about 80 lbs. They are very large, mixed breed of Dalmatian/great dane/lab! They live a pretty relaxed life, sleeping most of the day, playing outside whenever they want and lots of snacks all day from the girls and I (as we stay home). Oh, to live like a dog :) Happy Birthday my sweet babies! We love you so much!